The number of Canadians collecting employment insurance benefits has hit an all-time low. 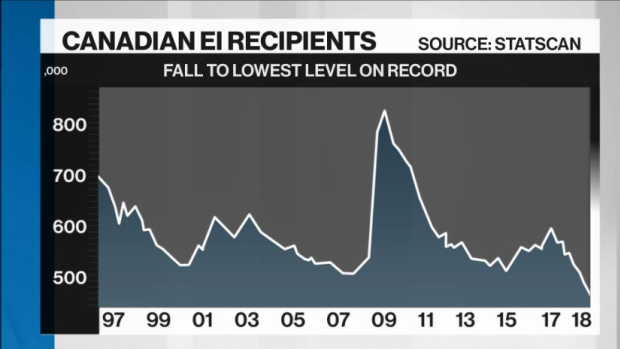 The total number of EI recipients plunged 18.1 per cent year-over-year to 453,060 in April, a level not seen since Statistics Canada began gathering data in 1997. The drop in beneficiaries was broad-based in the month, with every province, occupation group and demographic posting declines. Provincially, Alberta and New Brunswick saw the biggest drops, with 5.1 per cent fewer people collecting benefits in each of those provinces, while the number of continuing claims in the natural resources sector and manufacturing both fell nearly 20 per cent. The employment insurance benefit data is just the latest in a string of broadly positive developments in the Canadian labour market. Canada’s unemployment rate has held steady at 5.8 per cent for the last four months of available data, marking a multi-year low. Average hourly earnings have also staged a recovery, rising 3.9 per cent year-over-year in May, the fastest pace of wage growth since 2012.